IT SOUNDS like something out of British sci-fi series, Humans, in which older people are cared for by lifelike robot helpers — but it is turning into a reality in a pair of care homes in southwest France. Milo, created by Dallas-based robotics company Robokind, has made headlines worldwide because of its success at helping children with autism, but is being tested as a means to reduce loneliness among residents at Edenis-run residential homes at Villeneuve-Tolosane and Houlette in Pibrac, where the 55cm robot reads books, interacts and plays games with the residents. Milo is not the care homes’ only robot helper. A less human-looking but no less welcome robot — basically a TV screen on wheels — allows distant family members to ‘virtually’ visit residents via video-call applications, such as Skype. “Although nothing can replace a physical visit, circumstances are sometimes difficult to get around for families,” explained one of Edenis’s founders, Faisal Houhou. 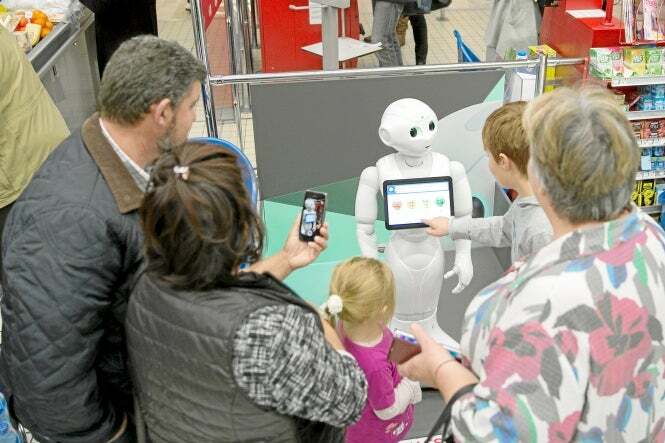 Meanwhile, the supermarket chain Carrefour has introduced another robot, Pepper, which is described by its Paris-based manufacturers Aldebaran as the world’s first emotional robot, in three stores at Claye-Souilly in the Seine-et-Marne, Ecully in the Rhône-Alpes and Nantes Beaujoire in the Loire-Atlantique. Pepper was developed by Aldebaran Robotics in conjunction with Japanese telecommunications company SoftBank. It is programmed to communicate with humans and can react to your emotions as it detects whether you are sad, angry or happy by the tone in your voice and the expression on your face. Train operator SNCF, too, has run trials with Pepper at stations in Nort-sur-Erdre, Saumur and Sables d’Olonne in Pays-de-la-Loire. In one video that was posted online, the robot responded to a question by admitting it was “not as smart as the SNCF ticket machines but, on the other hand, I am more polite”. Creators Aldebaran described Pepper as an excellent communicator that would would willingly approach and try to talk to someone who is up to 1.5m away. Laser sensors allow the robot to avoid obstacles while moving and when the battery level is low, it returns to its recharging station. The robot has proved hugely popular in Japan, where Aldebaran is in partnership with SoftBank and where Pepper was first launched in 2014. The company said that about 1,000 have been sold each month since June last year. They cost €1,500 each, plus €200 a month for three years. Despite the expense, SoftBank said that Pepper robots sell out within a minute of going on sale and that they are often used in shops to welcome customers. Pepper was originally created by Bruno Maisonnier, who had dreamt of building humanoid robots since he was a child. His aim was to create companion robots which would interact with people. He said robots would be ideal for home care, entertainment and has also experimented with autism therapy. His first robot was called NAO and 7,000 have been sold globally.